Hello All - it is been quite a while. Its good to be back. In this post, lets see what are the new features that latest version of IBM BPM (IBM BPM v8.6) brings to the table (Of course for those who doesn't know already). Experience improved performance in Process Portal when you have access to a large number of saved searches. That's all for now. See you soon with more post. Many of us are aware of what bootstrap is and how that can help in creating a responsive UI that will adjust the UI layout based on the device in which the screen is opened. In this post let us look at how to build a near responsive UI with stock coach components using bootstrap. The idea is to exploit the bootstrap’s concept of dividing the screen in to twelve columns to adjust the layout automatically based on the screen resolution. Before going further, the first thing that needs to be done is download the bootstrap CSS and import that as a managed web file in to your toolkit / process app. 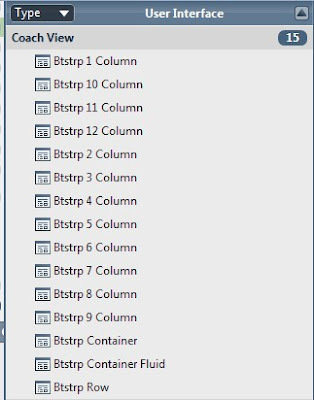 Now we will have to create several containers such as rows /columns that uses the bootstrap CSS as shown below. 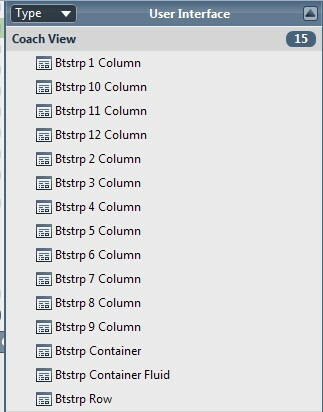 These columns are key to the responsiveness of the UI when the screen/browser resolution is changed. We all know that we can create an ad-hoc task in an instance from the instance view of process portal. I have come across a scenario where I need to invoke an ad-hoc activity in the BPD programmatically instead of from instance view. After some research I found these two options using which we create an ad-hoc task for an ad-hoc activity in the BPD. In this post, let us look at system API method for invoking ad-hoc activity with name "Adhoc Update Request", which is created as a sub process in the BPD. Before we start, we need to add Dashboards Toolkit to the Process Apps, as some of the object that we use is available in this toolkit. This will initiate a task for the ad-hoc Activity in the given process instance. Thanks for reading the post !! com.ibm.ws.exception.ConfigurationError: com.ibm.websphere.ssl.SSLException: Cannot get security object from WCCM. Caused by: com.ibm.websphere.ssl.SSLException: Cannot get security object from WCCM. After some research on this I found the resolution for the same and thought of sharing that with you all. Now don't ask me how this got corrupted :) . First one being : get the file from a backup copy (if you have one). Second way: the same file could be copied from another profile in the cell, e.g. : ...\profiles\Profile2\config\cells\PCCell2\security.xml or get this file from another working copy of the installation and replace it with the corrupted file. Once you replace the corrupted file , try to restart the server and it should work. (Atleast you should not see this error and it worked for me). Many a time during our development, we need to calculate the time zone offset (time difference) between two different time zones during the date manipulations. In this Post, I would like provide a simple function which will give the time Difference between two Time Zones. This is one area which most of us including are under the impression that SOAP Faults can not be handled with the web service integration of IBM BPM. It is very much untill the version8.0, but the support has been provided starting from v8.0.1. The link below tells you on high level on how to capture the soap fault using the error event in IBM BPM. your WSDL operation looks like this, similar to what is shown in the above link. What does this link won't tell you and you need to know in order to make this work ? In this Post, let us look at how to retrieve the Server host name and port in different environments. The general practice is to use an environment variable for host name and port which can be used to hold these constants and change these values when you promote the code to higher environments. I found a way to retrieve these values programmatically using the apis that comes with IBM BPM, just thought of sharing that with you all. Below is script which will fetch these values dynamically. Above statement gives the instance of the server. server.getServerHost() - This gives the Host Name of the BPM server. In this post, let us look at how to write a file attached in IBM BPM (to an ECM ) on to the file system and send that file as an attachment in the email Notification. BPM uploads the document attachments to an ECM document store. 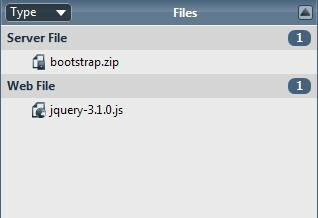 A folder already created and folder id is generated (Of course using the services available in Content management Toolkit !! ) in the ECM for a given application. On a high level, this solution can be divided in three parts such that: a) Retrieve the file from content store (ECM), b)Write file to a file system, c) send the email by providing the file location to email service. Let us look at this solution in details. In this post, let us look at some of the commonly used server side data validations using the regular expressions and how to use them with the BPM variables. I am providing ready use methods for some of the commonly used Reg Ex validations in this post just for your reference for future use when ever required. Having defined these methods in the either js file which is added as server file in File section in PD and can be used globally across the application or these can be defined locally in a server script and can be invoked at that server script level as below. Hope this post is helpful !! Document upload and download is one of the import use case in the BPM processing. In this post let us look at how to upload a document from the process instance during the process and retrieve the documents corresponding to a given process instance in a standalone human service? What is mechanism used to store the documents in IBM BPM. In IBM BPM documents are stored using a document store (Out of Box ECM) provided by IBM BPM. It is also possible to connect to an external ECM from IBM BPM. IBPM suite provides a toolkit out of box called Content Management Toolkit which contain some predefined services and coach view to upload and access the documents to and from the IBM BPM document store. The coach view Document List can be used to upload the documents to IBPM document store or for that matter to any External ECM system which is CMIS compliant. In this post let us look at how to upload the documents to IBPM document store from process instance and associate those documents with some unique parameters such as process instance Id and retrieve them in a standalone screen based on the document parameter ( In this case let us use instance Id as document parameter). Below image shows the image of Document List Coach View from Content Management Toolkit. In most of the UI applications, display of confirmation dialog when trying to delete some data or cancel the current operation is a very common use case. In this post, let see how to create a coach view with a button which will do this. Below Image shows the confirmation dialog on click of the Delete button. Display of Confirmation dialog is one of the very common use cases in any UI based application in such as "delete" operation, "cancel" operation etc. In this post let us see how to create a coach view which can used to display a confirmation dialog as shown below. From IBM BPM v8.5, the Assignment options which were there before such as "Last User in the lane", "Routing Policy", "List Of Users" and "Custom" were deprecated an can no longer be used for the Task Assignments. In older version the option "Custom" was being used for dynamic assignment of Team or User to a Task. In the latest versions of IBM BPM i.e., from V 8.5.0 a new way of assignment has been introduced i.e., using the "Team Filter Service". In this post, let us look at a code sample illustrating the Dynamic task assignment for user using Team Filter Service. As a first step create a simple BPD with one Activity with a Human Service. 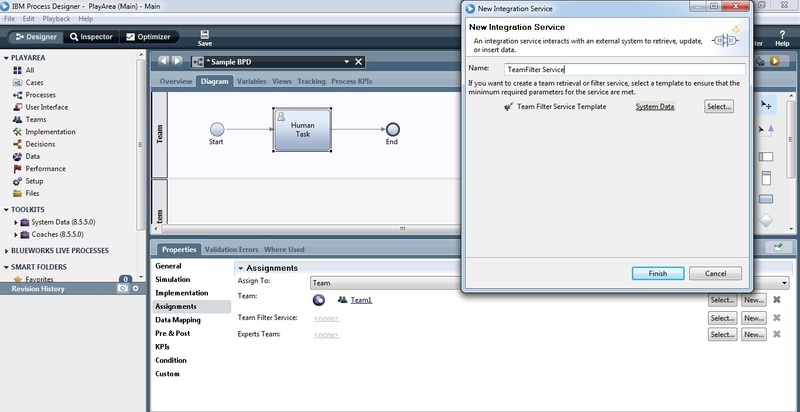 Click on the activity and navigate to Properties --> Assignments and click on new in-front of "Team Filter Service" to create a new Integration service (team filter service) as shown in below figure or select an already created service. In this post, let us look at how display the value from a server side variable on a coach using custom html. In older versions of IBM BPM i.e., before v8.0 it is easier to both bind a server side variable and access value of server side to a custom html using the syntax tw#local#variable using which a variable can be bound to any input control of the custom html which enables us to get or set the value to or from the variable. But starting from the v8.0 after the introduction of new coaches and coach view, the above syntax no longer works and it is also not possible to set the value to a server side variable directly from the input control but it is possible to get the value using the below syntax. IBM Business Process manager (BPM) advanced v8.5.5 is now offering basic Case management in its BPM Suite. The basic case management solution is derived from one of the IBM’s offerings called “Case Manager”. It also includes an embedded content repository whose usage is restricted to support the basic case management documents &amp; folders. The restricted use of this content repository can be extended to support unlimited content management use cases with IBM ECM. Below are some of the key differences between business process management and case management. Now a days REST protocol has become very popular for interaction between various system. REST services support both json as well as xml as i/o. In this post, I would like to illustrate with an example on how to parse the json response / json object to retrieve the data and assign it to a tw variable by using json2.js file. 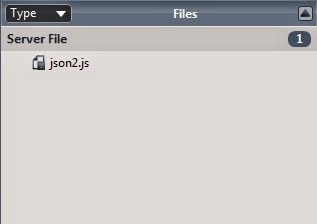 Let us first attach the file json2.js to the files sections under server files as shown below. 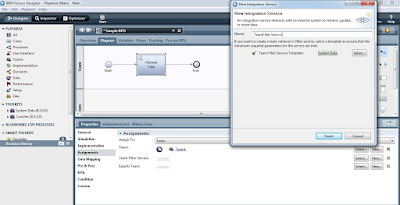 IBM BPM provide a connector "read from http" in system toolkit to invoke the REST service call. This connector supports both get and post methods while invoking the REST Service. But the disadvantage with this is that it will support only when the input is in the form of either query parameters or form parameters, but not when the input has to be sent as Entity to the REST service. In this Post, I would like to illustrate an example on how to perform a rest call which where the input has to be passed an entity instead of name and value as illustrated in my other post. Below is the xml input which has to be passed to the rest service. let us use a server scriptlet to bind this input xml to the variable tw.local.inputString. Below code can be to invoke the rest service by passing the necessary input to the service call. Below shown is the xml output the above response, which is in String format. you can also refer the post on how to convert XML string to XML. Hope this post is usefull !!! Thanks for stopping by. If you like this post leave a comment, share it and do a g +1. Many of us might come across this requirement of server side caching mechanism in IBM BPM, especially when the applications are UI heavy, involves lots of users or expensive data preparations. 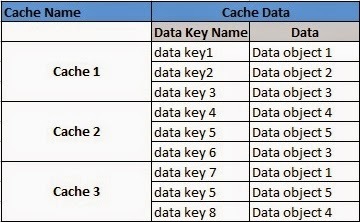 In these kinds of scenarios Caching comes to rescue in-terms of improving performance by avoiding expensive operations like database calls or web service calls to fetch the commonly used or rather static data (which doesn't change more often) that needs to be displayed on to the UI. In IBM BPM, there is beautiful option for this called jsCache. You can download the jsCache.js file by clicking here. In this post, I would like discuss about an issue with Coach Validation when there are multiple button validations available in a single Coach and possible solution for the same. First let me describe the issue. I have a coach which has three buttons, Button1, Button2, Button3. On click of each button, field validation should happen for the fields corresponding to each button. you can go through my other post related to UI Validation to understand on how to do validation in IBM BPM. In the below image, 'tick' mark for each transaction (line) indicates that validation should be performed on click of that particular button. Unfortunately, even though validations has to be performed for multiple buttons, all the validations should be handled in a single Validation Script (you can notice in the Figure 1 that there is only one validation Script). In order to validate the fields corresponding a button, we need to identify which button is clicked up on. To identify the button clicked up on, we can bind a Boolean variable to each button as shown in Figure 2 and on click of the button, the bound variable will be set to true. In the validation Script, we can verify this button variable (Boolean) and if true, then validate the corresponding fields for a particular button. This post will give you a brief description about the life cycle of IBM BPM coach view and helps understand what are the various event handlers available in coach view and high level description of each coach view. Click here to watch this video in you tube. Hope this is helpful to understand coach view at high level. Home | About me | site map | Copyright © 2018 ibpmcoding.com . All Rights Reserved.